To furnish the diverse requirements of our clients in the best possible manner we are involved in offering an extensive range of Form Milling Cutters. Special Profile Milling Cutters, manufactured to Precision Form and Relief for ensuring Accurate Profiles after repeated Sharpenings. We produce special form cutters for cutting racks, serrations and splines. These are produced in single or multiple rows with straight or spiral flutes with very close tolerances. 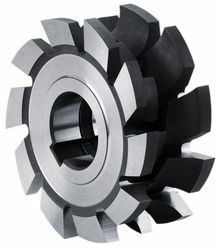 We provide our clients with an elegant range of Form Milling Cutters. GMT produces form milling tools for all types of applications based on our customers specifications. Whether standard or custom non-standard we have a solution for everything. 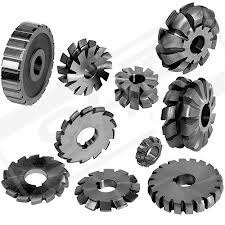 We manufacture tooth-form cutters, spline-milling cutters, groove-milling cutters, and thread-milling cutters. Our company is highly esteemed in providing Form Milling Cutter. We have been counted amongst the most trusted names in this domain, engaged in offering a standard quality range of Forming Face Milling Cutter. Gear Cutters With Special Profiles in Ground And Unground Forms Are Supplied or Custom Made As Per The needs. Rack and Bevel Milling Cutters Specific To Cut The Number of Teeths are also provided. Cutters with Special Profiles made to specific requirements of the customer in Single, Multi and Interlocking profiles can also be had on specific request. We manufacture Ground or Unground Form Milling Cutters from a variety of Imported materials suited to your job requirements. A large variety of coatings are available to enhance performance and durability of the tools.